Home > Shop By Brand > Dodo Juice > Dodo Juice Lime Prime Pre-Wax Cleanser Polish 250 ml. Dodo Juice Lime Prime Pre-Wax Cleanser Polish 250 ml. Prep your paint with Dodo’s lime-scented micro abrasive polish. Dodo Juice Lime Prime Pre-Wax Cleanser Polish breaks all the rules with micro-abrasives to remove oxidation and light swirl marks, cleaning agents to remove watermarks and ingrained dirt, and lubricating oils for slickness and gloss. Lime Prime is a total one-step prep polish for any paint finish before wax application. Prime your paint for perfection! Dodo Juice Lime Prime Pre-Wax Cleanser Polish contains micro abrasives to gently but effectively remove light swirls, water spots, and imperfections while improving the luster of the paint. Old layers of wax and ingrained dirt are removed, revealing the cleanest, clearest finish. Once one of Dodo Juice’s waxes is applied, it will bond better and shine more brightly on the freshly primed paint. Natural oils in Dodo Juice Lime Prime Pre-Wax Cleanser Polish serve not only as lubricants; they also enrich the paint to restore the depth of color and shine. The paint will look and feel glossier. Dodo Juice Lime Prime Pre-Wax Cleanser Polish is for paint with mild imperfections, such as light swirls and water spots. If your vehicle has no visible defects, use Dodo Juice Lime Prime Lite for an abrasive-free paint cleansing. Dodo Juice Lime Prime Pre-Wax Cleanser Polish will give you the best results if applied with a polisher. Use it before applying any Dodo Juice wax for the first time and periodically thereafter to prep the paint for fresh wax. Lime Prime has a fresh lime scent. Use a soft foam or microfiber applicator, or your bare hands, to apply Dodo Juice Lime Prime Prewax Cleanser. A very thin, even coat should be applied. Then buff with a microfiber towel or bonnet. Wash and clay the vehicle as needed. Shake bottle. 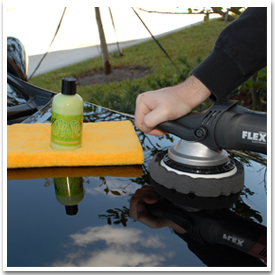 Apply a small amount of Dodo Juice Lime Prime to a clean foam finishing pad on your polisher. Work at a slow speed and apply Lime Prime to once section at a time. Be sure to get good, even coverage. Work in a back and forth, overlapping motion until the polish is nearly clear. Then buff off with a soft microfiber bonnet or towel. 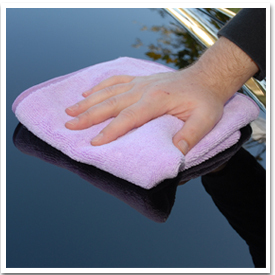 We recommend the Cobra Super Plush Deluxe 600 Microfiber Towel for safe, scratchless buffing. To apply by hand, wipe Dodo Juice Lime Prime onto the paint, section by section, with a clean microfiber applicator. Buff off with a Cobra Deluxe Jr.600 Microfiber Towel. I tried this product, and I can't really say that it is effective at all, I used it on VW and it clouded up and was kinda runny, it literally dripped off my applicator onto the ground. the application seemed ok, but it really did not remove anything, I had to go over the same area I did later with clay to get the finish and result I wanted. I tried it on other panels, and it just kinda clouded up and got hard to remove. It has all these warnings as well that are not posted on the info about it scratching up your paint, so be aware. Constoo runny, not effective, abrasive, and strange drying and hazing when applied. I use Lime Prime on a yellow Meguiars pad with a DA polisher. This gives me an amazing finish and gloss. I have used Lime Prime on various cars of friends and family and the results have always been superb. The process is: Wash -> Clay -> Wash -> Dry -> Lime Prime -> Dodo Juice Supernatural Wax (two coats). Easy to use, no dusty residue and spectacular results. This is one product I will always have in my kit. I used this polish as a finisher after Wolfgang's Total Swirl remover. It has very little bite, so I can't comment on it's ability to remove swirls. Mainly, my swirls were already removed by Wolfgang before using this. That said, Lime Prime finishes extremely well. It goes on easily, and in a very thin layer. I had no trouble using it with my DA. It buffed off easily and with very little left-over polish residue. After buffing, I found a glass-like surface that beats all others that came before it. I don't think I've ever finished my paint as well as I did with Lime Prime. Considering that, I can really only recommend this if you have a DA. If you don't have a DA, this is not the polish you're looking for. I never had amazing results with this when using it by hand. It did a decent job, but nothing that was worth the price tag. That all changed when I used it by machine. It really unlocked the potential of this polish. Main point, only buy this with a DA. If you do, you won't be disappointed! It's well-worth the high price. I have tried for ever to get acid rain spots off of my truck and car with local parts store products but only half the spots would come off even with my buffer, but now with this product my paint doesn't have 1 acid rain spot !! my paint is perfect !! I will forever buy DODO Juice products.